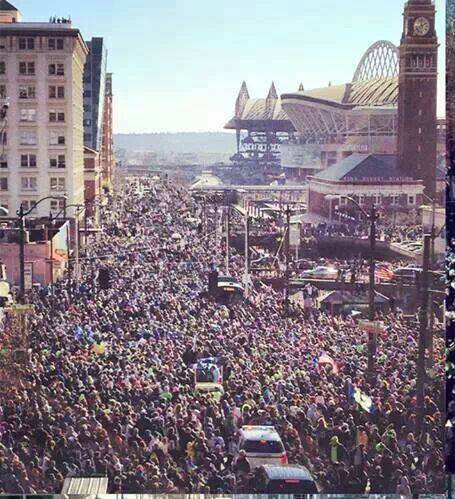 My hometown Seattle Seahawks won the 2014 Superbowl. That is the first championship of a major sport for Seattle since the Supersonics in 1979. The parade was crazy! It was estimated before the event that there would be somewhere between 200,000 to 300,000 that would be there. During the event the police estimated there were more than 700,000. It was insane, but great. The best part was being in the midst of the crazy scene – all being united together in a common cause. Something to remember for sure. Here is a picture I came across that kind of gives a perspective of what it was like. The resolution is not very good, but it helps show things. This view is down at the end of the parade. The parade was over 2 miles long – and this was just the end of it. By the way – in spite of all the huge crowds there were no violence or major problems reported by the police other than massive traffic jams.